Why do house-builders keep fitting boilers so big they’ll never run at peak efficiency? Where next for UK climate policy – seizing the nettle or pushed into the miscanthus*? Comfort’s good, but should we risk the climate? How much heat do you lose through your party wall? It may surprise you to hear that you could be losing up to 10% of the heat from your home through the party wall between your home and your neighbours’. If your home is part of a terrace or semi-detached then you have at least one party wall. If this wall has a cavity it could be an important route for heat loss, especially if the cavity is not very airtight. Would you like to know how much heat you are losing? So would the UK Government. Jason Palmer is coordinating a large research project for BEIS, the Government’s Department of Business, Energy and Industrial Strategy. 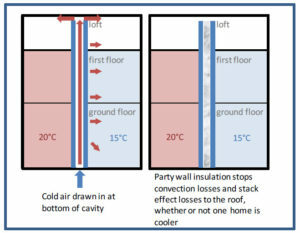 This will help to quantify the savings from insulating cavity party walls. We already know that cavity party walls can be a considerable heat loss but we need more data – we need to measure the heat loss in more homes – to see how big a problem this is. Confirm that filling the cavity fixes the problem. The results of this research could lead to government policies aimed at encouraging people to fill party walls – as well as external walls – to reduce heat loss. Do I have a cavity party wall? Cavity party walls became fairly widespread after about 1945, motivated by reducing noise from neighbours. However, building regulations do not actually require a cavity, so many houses of all ages have solid party walls with no cavity. Homes built since 2010 had to have insulated party walls from the start. We can tell you for sure whether your party wall has a cavity, but there are some rules of thumb. All blocks or bricks in the party wall visible from the loft are placed longways (with the ‘stretchers’ visible). If you would like to take part, we need to fit sensors to your wall to log temperature and heat flow for up to three weeks. We will need to fit three sensors on each wall, in different rooms. We can offer a cash payment of £100 as an incentive for taking part. This entry was posted in Energy research. Bookmark the permalink. Copyright © 2019 Cambridge Energy - Real insights from real data.